Gerry Anderson's beloved supermarionation series Thunderbirds has been a part of the childhood of generations of viewers in Britain and beyond. Despite being made way back in the 60s the iconic series has endured, seemingly making a comeback roughly every decade or so. Attempts to modernise it haven't proved fruitful, with an ill-fated anime sci-fi remake and a live-action Hollywood adaptation that crashed and burned. So it was that eyebrows were raised when it was announced that 2015 would see a brand new version of the adventures of International Rescue. Much to purists dismay Thunderbirds Are Go jettisons old-fashioned puppetry for shiny CGI- this time seeing the UK producers ITV teaming up with New Zealand effects whizzes WETA. Following a few teasers and images we now have the first proper trailer to feast our eyes upon. Although the old-school charm of the model work and puppetry may have been lost, the iconic vehicle designs and locations endure (got to love that Thunderbird 2). The broadcaster is obviously pretty confident in the result though- they've already ordered a second season. 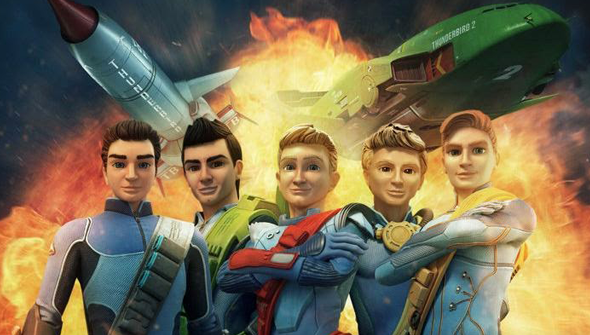 Thunderbirds Are Go will air on CITV in the UK from April 15th.